Google will take the wraps off its third-generation Pixel and Pixel XL smartphones at an event on October 9, 2018 in New York. Ahead of the announcement, a devastating new leak has revealed the final design of the handsets, as well as the three colours available at launch. Has Google leaked a load of decoy Pixel 3 devices to hide its real new iPhone rival? The latest leaks, which come courtesy of Android Headlines, purportedly reveal of 6 variants of the Pixel 3 and Pixel 3 XL that will be available at launch. Despite Google itself teasing the prospect of a third, smaller screen version of the Pixel 3, this new leak appears to confirm that the new handset will only be available in two sizes, just like its predecessor. The Pixel 3 will have thin, curved bezels around its 5.4-inch screen – almost identical to those found on the Pixel 2 XL last year. Meanwhile, the Pixel 3 XL will have a notched display, marking another step towards omnipresence for a design that was the target of a certain amount of controversy, when it first appeared on the iPhone X. The notch – a cut-out at the top of the all-screen design to house the front-facing camera, speaker, and a slew of sensors – looks set to allow Google to squeeze a humungous 6.71-inch display into a phone that can still fit into most pockets. Aside from the notch, there appears to be little to differentiate between the Pixel 2 and the Pixel 3 range. On the back, you'll find the same single-lens rear camera, circular fingerprint reader, and subtle two-tone effect. Since it doesn't appear Google is making the switch to glass for the back of its Pixel 3 handsets, don't hold your breath for wireless charging this year. 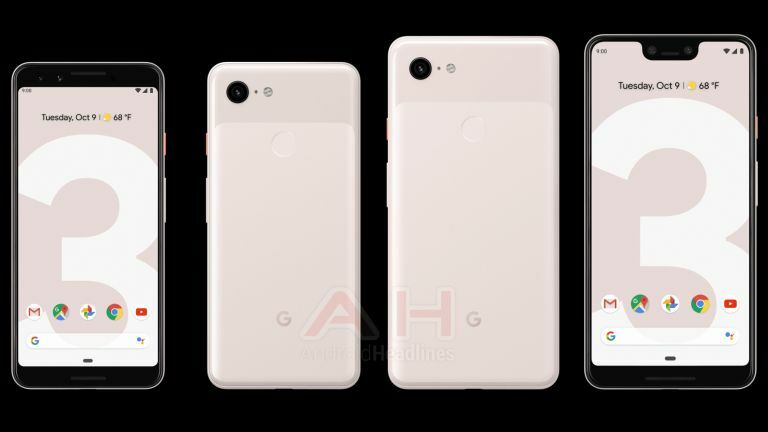 The leaked images also reveal the three colour finishes set to be available for the Google Pixel 3 and Pixel 3 XL at launch – Black, White and Sand. As for the rest of the specs, the use of the Snapdragon 845 chip seems inevitable, as it's in every other Android flagship this year. RAM and storage may well get a boost too, but Google will no doubt also emphasise the importance of AI and the cloud in ensuring the smooth performance of the Pixels. If you're a fan of the squeezable mechanism found on last year's Google-branded phones, you'll be pleased to know it's making a comeback, as per an official video uploaded to the official Google Japanese YouTube channel. Google dropped the 3.5mm headphone port last year and purportedly has no plans to reinstate it with the Pixel 3 and Pixel 3 XL. As a result, charging and audio will be handled by the USB-C port. Although, we have heard whispers that this is the year Google will include wired headphones in the box with the smartphone, which would certainly be a welcome addition. We'll find out for sure at the Made By Google hardware event on October 9, 2018.